Prev box is KC03: Upper Funston Meadow #2. 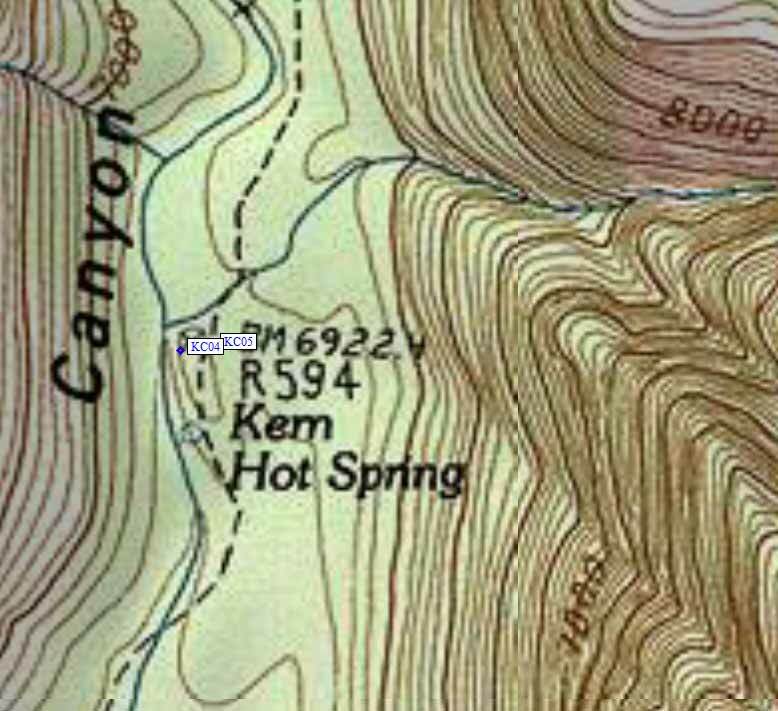 Next box is KC05: Kern Hot Springs east of trail. KC04 is a standard box, at about 6900 feet, in the GPS route KERN CANYON. Note: Kern Hot Springs is where Rock Creek joins the Kern River, but the Rock Creek bearbox is far upstream and there is no direct trail between them. There is a concrete tub with wooden privacy screen at the hot springs, and the campsites are just up-canyon in the trees. A single box, located just west (i.e., to the left if proceeding upstream) of the Kern Canyon trail, about 50 or 60 yards from the Springs themselves, and about 30 yards downstream from the adjacent box KC05. It is immediately visible from the trail. I saw two boxes in the established camp site along the trail north of the hot springs. Supposedly there is a third box. I did not see it, nor did I look for it. One bear box is at the campsite just north of the Hot Springs meadow, between the trail and the river, 80 yards north of the Hot Springs bulletin board, serving two campsites. (lat,lon) = (36.4792200, -118.4060300) in decimal degrees, NAD83. (zone,east,north) = (11S, 374125.0, 4037826.0) in decimal meters, NAD27.